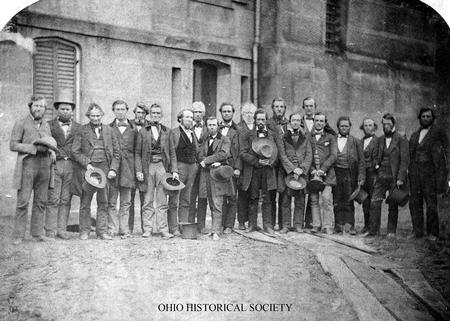 Reproduction of a photograph depicting the Oberlin Rescuers at the Cuyahoga County Jail in April 1859. These twenty men were arrested upon attempting to free an alleged slave from his captors. The event became known as the Oberlin-Wellington Rescue. The image was collected by Ohio State University professor Wilbur H. Siebert (1866-1961). Siebert began researching the Underground Railroad in the 1890s as a way to interest his students in history. John Price, a fugitive from slavery, became the center of the Oberlin Wellington Rescue Case of 1858. On September 13, 1858, John Price was arrested by a federal marshal in Oberlin, Ohio. He was eighteen years old at the time and had run away from a Kentucky slaveholder a few years before. Under the Fugitive Slave Law of 1850, the federal government was required to assist slaveholders in reclaiming fugitive slaves. The marshal knew that many Oberlin residents were committed to abolitionism. To avoid conflict with local people, he took Price to nearby Wellington. As soon as Oberlin residents heard of the marshal's actions, a group of them went to Wellington. There, they joined like minded residents of the Wellington community and attempted to free Price. The marshal and his deputies took refuge in a local hotel. After peaceful negotiations failed, the mob stormed the hotel and found Price in the attic. The group immediately returned Price to Oberlin, where they hid him in the home of Oberlin College's president. A short time later, they took Price to freedom in Canada. It is not known what happened to Price after he arrived in Canada. A federal grand jury indicted thirty-seven of the people who freed Price. Only two of the people indicted went to trial. These court cases became known as the Oberlin-Wellington Rescue Cases. Simeon Bushnell and Charles Langston were found guilty in federal court in April 1859. Bushnell received a sentence of sixty days in jail, while Langston had his punishment set at twenty days. The remaining thirty-five people in jail were released in July 1859. State authorities arrested the federal marshal, his deputies, and other men involved in John Price's detention. It was agreed that all of these men would be released and not charged with a crime, if the remaining thirty-five prisoners were immediately released. Bushnell and Langston filed a writ of habeas corpus with the Ohio Supreme Court. They claimed that the federal court did not have the authority to arrest and to try them because the Fugitive Slave Law of 1850 was unconstitutional. The Ohio Supreme Court upheld the constitutionality of the law by a three to two ruling. Members of Ohio's abolitionist community were angered by this ruling. More than ten thousand people participated in a Cleveland rally to oppose the federal and state courts' decisions. Because of his support for the Fugitive Slave Law, Ohio Chief Justice Joseph Swan failed to win reelection to the court.